N.E.T. 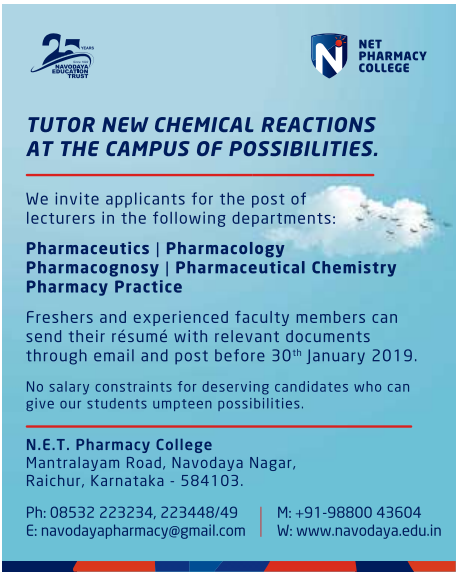 Pharmacy College, Raichur has advertised in the DECCAN HERALD newspaper for recruitment of Lecturers jobs vacancies. Interested and eligible job aspirants are requested to apply on or before 30th January 2019. Check out further more details below. About College: The year 1992, was a landmark year for North Karnataka, since, it saw the establishment of the N.E.T Pharmacy College by Navodaya Education Trust, Raichur, Karnataka. It was established by renowned personality with perfect vision, Sri S.R. Reddy, Chairman, N.E.T. who is unique in sharing the responsibility in overall development of Navodaya Institutions.